S’mores. I have fond memories of eating these at Girl Scout Camp and after barbecues or cookouts. If a grill was still warm, and we could toast marshmallows, we made s’mores. Several years ago we had friends over for dinner. As a throwback to childhood, I bought marshmallows, chocolate bars (some with almonds – delicious nutty goodness! ), and graham crackers. It had been years since we’d had them, and it brought memories racing back. Flash forward to May 2015. Going to a Memorial Day party where kids might outnumber the adults, and I thought about how to make s’mores portable. I have used the small graham cracker tart shells in the past, and decided use them this time. They were a hit with kids and adults! Place the tart shells on a baking sheet. Place 3-5 mini marshmallows in the bottom, and top with chocolate ganache. Chill in refrigerator at least 30 minutes. Remove from refrigerator and place a dollop of marshmallow cream on the cooled ganache. 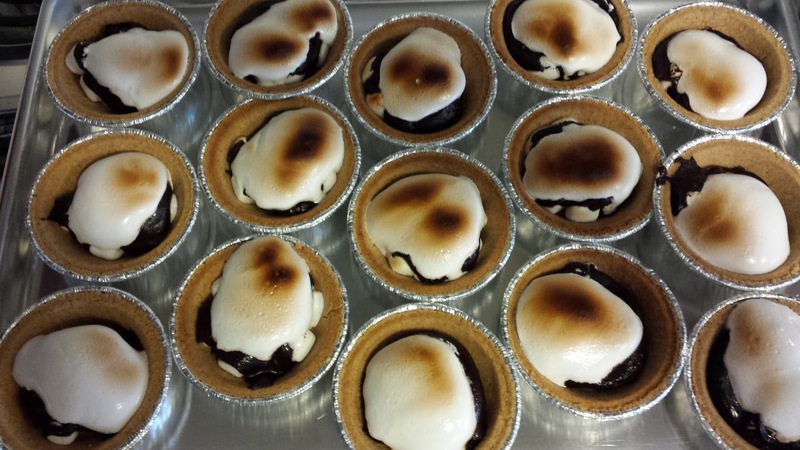 Place baking sheets under the broiler, and broil until the marshmallow cream has warmed up and turned brown. Remove from oven and eat now or later. Next time I make these, I’m going to use a torch to brown the marshmallow cream. It will be easier to evenly brown the tarts. < Previous Are you ready for some Football! !